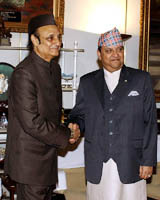 Prime Minister’s Special Envoy Karan Singh today expressed hope that King Gyanendra would make an “announcement” shortly on the political crisis there. 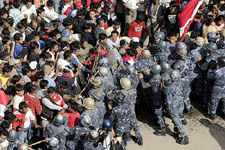 At least four protesters were killed and over 40 injured in Nepal today when security forces opened fire on thousands of pro-democracy activists who defied a curfew and shoot-at-sight orders in the capital to march against King Gyanendra’s rule. Shouldn’t all cases of crimes against women be sent to fast-track courts? A coal scam has allegedly surfaced in the Punjab State Electricity Board (PSEB). Informed sources said today that the imported Chinese coal being supplied to the various thermal plants of the PSEB was of substandard quality. Punjab Deputy Chief Minister Rajinder Kaur Bhattal today moved an application in the Supreme Court for further investigation in the case of alleged misappropriation of Rs 20 lakh from the Chief Minister’s fund by her when she was heading the government. The Sensex crossed yet another milestone today when it breached the 12,000 mark. After hitting an intra-day low of 11,866 points, the Sensex returned to its upward swing to close at 12,040 points gaining nearly 144 points at close. We all decided that we should back Kaif. His past record is good and he’s an outstanding fielder too. Yes, his form is worrying. India today rejected Saudi Arabia’s reported offer of mediation for resolving the Jammu and Kashmir problem and said it was discussing with Pakistan all issues under the composite dialogue process. Swashbuckling wicketkeeper-batsman Mahendra Singh Dhoni today became the world’s top batsman in one-day rankings with a phenomenal average of 52.76 and an awesome strike-rate of 103.